You’ve been facing a classroom of eager learners for at least a week (maybe even 4 or 5 weeks) and are starting to pinpoint their instructional needs. If you are at all like me, you’re always searching for that next “best teaching tool” to meet your students’ needs. 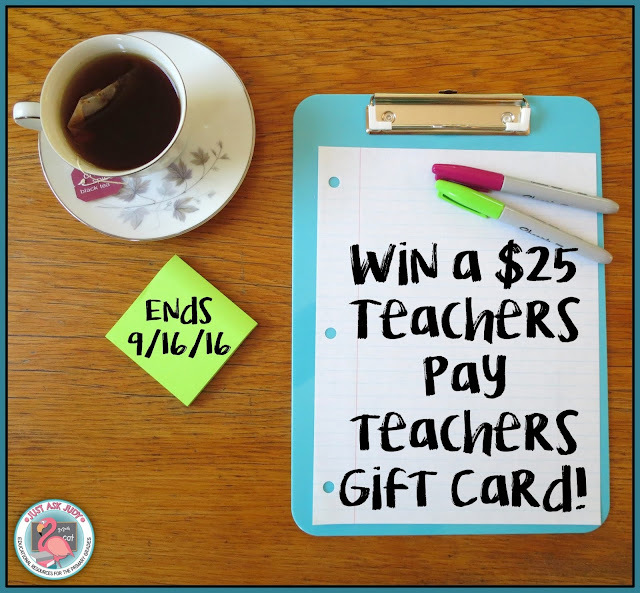 Take this opportunity for a chance to win a $25 Teachers Pay Teachers gift card to help fulfill their needs (or maybe just your wants)! Co-hosts: An Apple for the Teacher, Mickey’s Place, Just Ask Judy, Ms. K, ZippadeeZazz, Glistening Gems, La-Nette Mark, and Growing Grade by Grade. « Why Is That Scolding Hawk on My Balcony?